Education is a basic right for children all over the world. By having a good education, disadvantaged children are able to control their future. But accessing education is no easy matter for these children. Which is why the work of Cunina, an independent development organisation, is so important. Cunina is dedicated to giving disadvantaged children from the countries in the South access to quality education so that they can break the vicious cycle of poverty for the long term. Methis Consulting supports Cunina in its mission. We believe in the no-nonsense and professional approach taken by the organisation. Cunina also deliberately does not receive government subsidies so that it can work entirely independently. In 2015, Methis Consulting and Cunina embarked on a partnership together to make a difference in Haiti, one of the poorest countries in the world. Because corporate social responsibility really does stand for something in the world. In the past few years, we have supported the construction and expansion of the Notre Dame school in La Victoire, a small village in the interior of Haiti. This school of almost 900 pupils was in urgent need of secondary education facilities and equipment. Methis Consulting contributed to the building of the classrooms and helped to them fit out. We even provided a photocopier so that the pupils’ test papers and exams could be duplicated. Finally, we also worked on the construction of decent latrines. 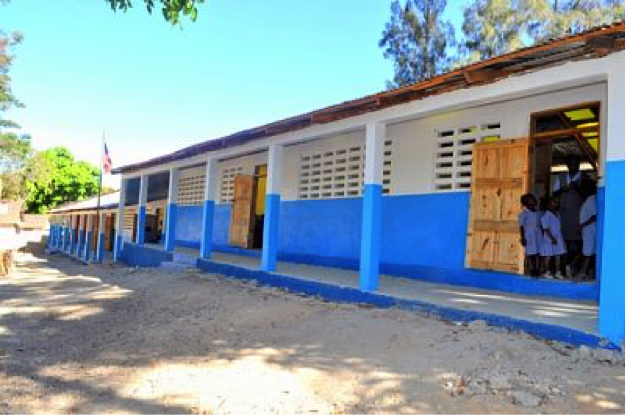 Hygiene in schools is a major problem in Haiti. Having good hygiene means that diseases spread less quickly among the children and so there is less absenteeism.